Zambia is among the forty-four other African Countries that have welcomed the establishment of an African Continental Free Trade Area (ACFTA) meant to create One African Market. The development was reached at during the 10th Extraordinary Heads of States and Government Summit in Kigali, Rwanda that was called by African Union Chairperson Paul Kagame. Foreign Affairs Minister Joseph Malanji who represented President Edgar Lungu at the summit signed the African Free Trade Area Declaration and not the Agreement. Mr. Malanji stated that Zambia has not signed the agreement on ACFTA because negotiations on some of the protocols of the agreement are still on going. He pointed out that Zambia had negotiated the protocol on goods, and services and the dispute settlement mechanism. Mr. Malanji said the remaining protocols that included trade competition, Investment and the intellectual property are yet to be negotiated. 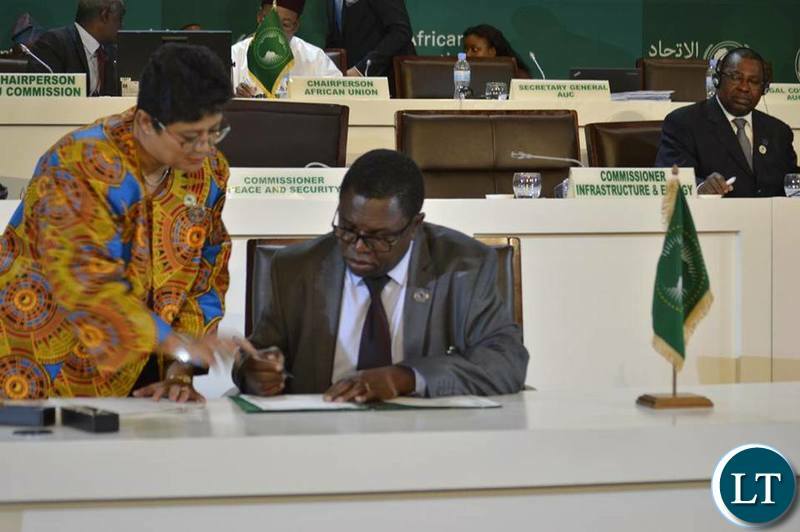 He however, noted that the signing of the declaration shows that Zambia stands with all other African Nations in its quest to improve intra Africa Trade. Meanwhile, Commerce, Trade and Industry Minister Christopher Yaluma said Zambia will not sign the protocol on the free Movement of People. In a statement issued to ZANIS in Lusaka this evening by First Secretary for Press and Tourism at the Zambian Embassy in Ethiopia, Inutu Mwanza, Mr. Yaluma who also attended the summit said Zambia is not ready for such a protocol. On the ACFTA, Mr. Yaluma explained that Zambia needed to undertake internal consultations with the business community and other stakeholders before signing the Agreement. He indicated that Government will only engage in treaties that have a positive bearing on the Zambian people especially the youth and women. And officially opening the summit, Rwandan President Paul Kagame who is also African Union President noted that time has come for Africa to boost its own trade. General Kagame said the African Continental Free Trade Area is a sure way of economic prosperity and urged member states to ratify the Agreement. He further stated that the ACFTA will bring job creation particularly among the youths. African leaders are baffling they are so much into free movement of people and free trade without looking at the implications. Free trade mostly benefits advanced economies like south Africa because they have a large manufacturer base snd have a lot to export and gain. BUT the implications on weaker economies is massive unemployment caused by factory closures. Free movement and the wider integration of Africa is just a pipe dream think about the influx of Somalians ethopians and of course the never ending supply of false prophets from Nigeria. Regional integration is better if well managed. Why do you think there are xenophobic attacks in South Africa? This is a pipe dream. For any movement (such as this ACFTA) in the commercial, economic and trade spheres to be meaningful and succeed, it must be backed by the political unification of the African continent; and in toto, for that matter! Otherwise, the continent will continue groping in the wind and remain forever the floor mat of the world. NAFTA in America was bad deal. Anyway, we don’t understand the thing, just sign it. JUST LIKE YOU WENT TO ZAMBIANS WITH THE PRETEXT THAT THEY ARE GONNA HAVE A SAY ON WHETHER TO PULL OUT OF THE ICC, KINDLY ENGAGE ZAMBIANS WHEN IT’S TIME TO JOIN TUMA REGIONAL AND INTERNATIONAL GROUPING LIKE ACFTA. I hope these international collabos really help us in trade. (Continued)… systems that connect the countries together. Same thing with railroads. This will make travel faster, affordable and more efficient and will give birth to millions of jobs and businesses across the continent. Because as more and more people travel, either by bus or by train, or can drive self, there’ll be need for more gas stations, restaurants, hotels and motels, to cater to the travelers. There will also be a high demand for vehicles, and the rise of cross country bikers. Also the number of truckers hauling goods day and night will increase exponentially. (Continued)… common database to keep track of bad people. Whatever IDs that will be issued to the Africans, should have some chip or numbers on it that will allow security personnel to pull up someone’s criminal record at the port of entry of the country one is trying to enter. That way they can quickly know that someone is a criminal or that he has a warrant for his arrest. Without this common database, they’ll be no way to know who is coming into the country, and what their background is. (Continued)… who can come into their country. They’ll need some form of assurance that someone will leave the country once their legal length of stay in the country is up. That I’ll leave to the experts. Overall, the free movement of people across the continent of Africa has more pros than cons, and Zambia needs to support it. I would only suggest the PF Administration signs after Botswana has signed. I am not sure they fully understand the details. And if they do the doubt the commitment. You see free trade area requires agreement in the free movement of people. I doubt if they hold this view. @ James buga. I am no expert at economics but what you are saying is not always true from empirical data. In some cases, the so called advanced economies can lose. BREXIT is the case in point. Free movement of goods, services and pipo was disadvantaging the British (at least according to those who supported BREXIT. Same reason why the Trump administration is against NAFTA. My point is that these agreements depend on what you want. As the saying goes ‘the devil is in the details’. So the minister is right in not signing the agreement (details) but the protocol, Consultations first. Will need a cost-benefit analysis as well. If costs outweigh benefits, do not sign the damn thing. @ mpundu mwaume am glad you brought up the case of Brexit it perfectly explains my point. Here the major player is Germany the largest economy in the EU and probably the greatest benefactor. Also the issue you have raised about Trump and NAFTA is simple it’s the trade deficit America has with some of these countries which export more to America. BUT think critically about the economic situation in Zambia with a poor manufacturing base what will you export? Chorela? Do you sometimes wonder why we buy imported tooth pick when we have so many trees in zambia and we don’t need advanced technology to make them? Hazaluza Hagain! There we go! One Zambia One Nation! One Africa One Nation! I HAVE WELCOMED THIS WONDERFULL DEVELOPEMENT. I AM NOT LIKE OTHER ZAMBIANS WHO ARE ALWAYS THINKING IN THE NEGATIVE. WITH THE PLANS I HAVE I WILL BECOME A MULTI-BILLIONAIRE SOON. I WILL MAKE USE OF THE WATER AND THE LAND THAT WE HAVE TO CREATE GOODS TO EXPORT TO OTHER COUNTRIES. I AM NOT LAZY IN THINKING LIKE OTHER ZAMBIAN WHO ARE ALWAYS NEGATIVE. FELLOW COMPATRIOTS WAKE UP AND BE ACTIVE. Water and land to create goods what have you been waiting for? You hage not sold anything to Zambians what makes you think you can sell Nigerians anything. Kulota sitilesa manje ni ka lotedwe! @ James Buga 3.1. I hope I understand your debate with Mpundu Mwaume well (not very sure though). You two are almost saying the same thing from different views. @James Buga, by quoting the TRUMP NAFTA case, you are actually proving that it is not always that the advanced economies win. You and Mpundu Mwaume make the same point on NAFTA. Yes Germany is the strongest one in EU compared to UK. But UK is not a push over. Great debate all the same. but terrorists like buko huram will have free movements from one country to the others and plant booms. Free movement must not come first but eliminating terrorists must come first if not you will again close your boarders very soon.look example Europe was receiving refugees but terrorists also found their way as refugees to cause problems.our security systems in Africa are weak and useless.a war torn country can not do trade freely. I would wish one day for this to come through but its something that would take time and alot of solid planning. The best way i think this would work is to start with regional unifications. Let the southern region countries unite first, The east, central, west , and north each region by its own, start small then move on to uniting the whole africa. The most importantly be very careful on how you plan and keep some things and planning as secrets because mostly the big countries, big powers they are against africa uniting. Overall, this could work and would make africa more powerful and great.